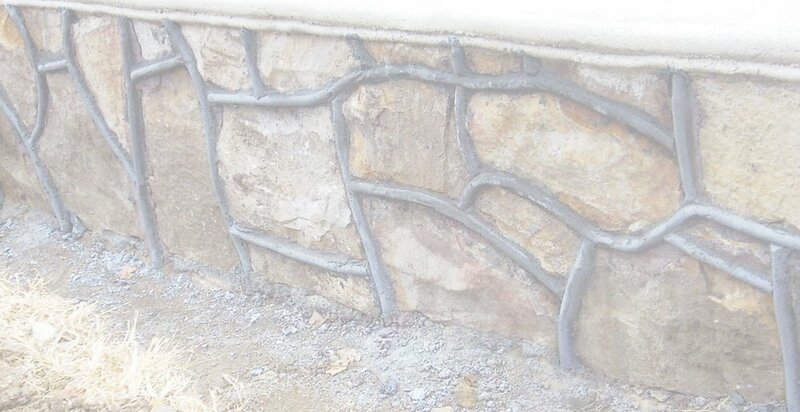 Mortar joint commonly known as large bead or grapevine in La Junta City Park Wall Restoration, La Junta CO. Full restoration of the WPA-era (circa 1935) historic walls at the public park was completed in 2015 by Western Masonry. Grant funding from the History Colorado, State Historical Fund was provided. Important aspects of creating effective specifications for mortar, addresses this key material for constructing masonry that is both attractive and durable. In some areas of the United States, two trends have been observed that are inefficient and potentially detrimental to masonry. One trend is for project specifications to exclude some mortars allowed by the consensus mortar standard – limiting mortar type or material selection is unnecessary. The other trend is an increased occurrence of high strength mortars being specified for masonry veneers – this can impair long-term performance and initial cleaning tasks. The mortar standard used throughout the US provides three mortar designations for new construction: Types N, S and M, in order of increasing comprehensive strength. A good rule of thumb widely accepted throughout the industry is to use Type N mortar unless there is a structural or durability reason to use a higher strength. For veneer, Type N is often the best choice. For structural masonry, heavier loads or higher seismic areas might require stronger masonry walls. Even for structural masonry, Type N can be paired with stronger masonry units to achieve adequate strength. The source of the ASTM C270 Standard Specification for Mortar for Unit Masonry is the American Society for Testing and Materials (ASTM) and its Committee C12 on Mortars and Grouts for Unit Masonry. A subcommittee of C12 on Specifications for Mortars, C12.03, brings together a broad range of industry participants representing designers, builders, material manufacturers and other experts, scientists and educators. Collectively, this subcommittee – presently numbering about 120 people – develops and maintains mortar standards through a consensus process, open to all. The result is comprehensive and balanced standards for mortar. Authors of C270, experts representing all aspects of masonry, have outlined its scope and purpose. The document can be used as is because it addresses mortar types, how to specify them, all acceptable materials, test methods, construction practices and more. Modifications to C270 are unnecessary. For exterior above grade use, the recommended mortar type for a loadbearing wall is Type N.
ASTM C270 references five cement standards for making masonry mortar: C150 for portland cement, C595 for blended cement, C1157 for hydraulic cement, C91 for masonry cement and C1329 for mortar cement. While most cements are grey, all can be made as white versions which are used to make pigmented mortars. For someone with extensive knowledge of materials who prefers one type of cement over another, modifying a specification to exclude certain binder (cement) types is allowed, but disregards expert input (C12.03 subcommittee) and could be inefficient. There have been reports of favoring one type of cement for mortar or biases against certain cements for mortar, but most specifiers are not familiar enough with materials as to recommend excluding the use of some. ASTM C270 provides two approaches for specifying mortar. One is the proportion method and the other is the property method. The proportion method is simpler, requires no testing and is used on the majority of projects. It is also the default specification if neither method is chosen by the specifier. The proportion method can be thought of as a recipe, spelling out relative proportions of cementitious ingredients to aggregate (sand). A common ratio is 1 to 3, but a range is allowed. For instance, 1 part masonry cement plus 3 parts sand satisfies the proportion method. Masons have leeway to adjust water content as needed per field conditions. If portland cement and lime comprise the binder, then the math is a little more complex, but not complicated. For Type N proportions, 1 part cement plus 1 part lime will result in an appropriate strength. This is equivalent to 2 parts of binder, 1 + 1 = 2. That requires 2 x 3 = 6 parts of sand. The 2 to 6 ratio still results in a 1 to 3 mortar mixture. The property method requires testing. In order to verify that the mortar will meet various fresh and hardened properties, specifiers select materials, send them to a lab and have the mortar tested. Fresh properties tested are water retention (minimum 75%) and air content (12-20% maximums depending on binder and strength level). The hardened property tested is compressive strength minimum at 28 days, with Type N needing 750 psi, Type S needing 1800 psi, and Type M needing 2500 psi on a 2'' mortar cube. One advantage of specifying mortars by property is the ability to use a slightly greater aggregate content, giving a more economical mortar. Unless it is a large project, however, the time and expense of testing is rarely worth the extra effort, which is another reason that proportion method is much more common. Over-strength mortars can lead to several problems. For structural masonry, inefficient structural design is more costly for owners and less green for the environment. For veneer, which accounts for a large percentage of masonry construction, carrying structural loads is not needed. The reason masonry mortars are often over-designed (specified too strong) is that mortars and binders may not be well understood. Although The Masonry Society (TMS) has been conducting University Professors Masonry Workshops (UPMW) for nearly 30 years, masonry is not a mandatory part of collegiate curriculum for the vast majority of engineering programs. The result is that practitioners reach a design office with little to no exposure to masonry design and have to learn it on the job. Potential for cracking is another problem of too-strong mortars. Because forces follow the path of least resistance, pairing mortars stronger than the masonry units drives cracking toward the units, whereas using weaker mortars with stronger units allows for small adjustments and the redistribution of stresses without damage to the units. Stronger mortars are harder to remove from the finished wall surface. Although masons strive for neat work, production builders may not be able to keep all mortar droppings or smears off the unit faces as they go, relying instead on a power washing of the completed wall to achieve a clean façade. Stronger mortars tend to gain strength faster, so when it’s time to clean excess mortar off the wall—often many months later—the mortar may already have bonded quite strongly to the exposed face of the units. This requires additional effort, such as stronger water pressure or use of chemical cleaners. Cleaning a façade following construction is designed to improve appearance, but aggressive cleaning may be potentially damaging to the finish, durability or appearance of the masonry (units and mortar) and adds cost. The proportion method is simpler, requires no testing and is used on the majority of projects. Masonry projects typically begin with selection of a masonry unit to achieve the desired building appearance. The majority of masonry projects will be constructed with local materials because ingredients are readily available in most geographic areas and due to the weight of masonry materials, shipping them long distances is not usually justified or necessary. Therefore, to ensure material compatibility, unit properties must be considered when choosing masonry mortar. Masonry systems comprise many parts that have to work together to be successful. ASTM C216 on facing brick and Appendix X1 of ASTM C270 on mortar offer some guidance about achieving a compatible combination of units and mortar. In accordance with C270- 14a, Appendix X1, Section 1.6.1.3: “Complete and intimate contact between mortar and masonry unit is essential for good bond. This can best be achieved through the use of mortar having proper composition and good workability, and being properly placed.” In one survey, architects selected bond strength and contractors selected workability as the most important mortar properties (see sidebar). Both bond strength and workability are required to achieve extent of bond for complete and intimate contact. It’s critical that specifiers understand how to assess mortar quality. It is often assumed that mortar strength testing is a good approach. It is not. Mortar compressive strength testing is not fast and not usually done correctly. The idea that it represents mortar strength in the wall is inaccurate. For a number of reasons, such as the non-absorptive mortar molds, the size and shape of mortar specimens (laboratory 2'' mortar cube vs. a site made 3/8'' mortar joint) and even the way the mortar is mixed in the field, strength tests of mortars do not provide results that are meaningful. Two companion standards to ASTM C270 can help when assessing mortar characteristics and quality. C780 on test methods for masonry mortar provides an explanation of each test for field or lab. C1586, a guide to quality assurance, helps users understand which tests are best suited to their needs as well as the proper use of C270 and C780. All three documents – C270, C780, and C1586 – caution against looking at mortar strength as a way to assess quality. There is almost always more strength than necessary. that they are proportioned and mixed properly. The entire approach is very much in line with the default specification being a recipe (proportion method). If a recipe is good, good results are obtained by making sure that the right ingredients are used in the right amounts and blended together in the right way. Material certificates can confirm that the right materials are used; product data or material certificates can confirm that the materials meet the required standards; and periodic observation of the proportioning and mixing process can confirm that the materials are being mixed in the right way. No other verification is needed, including no compressive strength testing for the proportion method. If a specifier is truly concerned about mortar quality, rather than requesting compressive strength tests, which can’t provide results until days or weeks later, there is a rapid test called the mortar aggregate ratio test that can give results within hours or by the next day. This test is described in detail in Annex A4 of C780. In short, it is a way to sample fresh mortar as mixed on the job, separate the sand from the other materials and run calculations to show the relative proportions of sand to cement, the same information by which the mortar was mixed, the proportion method. For instance, if the recipe called for 3 parts sand to 1 part cement, the mortar aggregate ratio test for a properly mixed mortar will give a result that is very close to 3 to 1. It’s fast, simple and with no damage to units. Throughout history, masonry has shown itself to be a durable, attractive building material and finish for all kinds of structures. It continues to be sought for its appearance and performance, even as the system and its components continue to evolve. New cementitious materials for binders, new masonry units and more complex wall assemblies can lead to better weather resistance and greater occupant comfort. These are all good things that can benefit society. Getting the design and construction of masonry right takes experience and education about the available information and tools. One of the most important pieces of information for masonry construction is the ASTM C270 mortar specification. For most projects, designers and specification writers should use ASTM C270. The standard provides three mortar designations for new construction, Types N, S and M, and allows for a variety of cement types to be used to make mortar. This robust approach to obtaining mortar for masonry construction is based on consensus information from all aspects of the industry, leads to efficient use of materials, and provides for contractor preference and market availability of materials. Unnecessarily restrictive specifications regarding mortar materials and a move toward higher strength mortars for veneer have been noticed in Michigan. Each of these trends has created its own problems – from material availability and efficient use of materials to potentially poor appearance. To address these concerns, Masonry Institute of Michigan (MIM) Executive Director Dan Zechmeister invited Jamie Farny of the Portland Cement Association to speak about “Effective Mortar Specifications” at a joint meeting of the Building Enclosure Council of Greater Detroit and the Detroit Chapter of the Construction Specifier Institute. “How Mortar is Chosen,” from an article in the 1991 magazine Masonry Construction, reported on a survey conducted in October 1990 showing that, out of fourteen mortar properties, bond strength is most important to architects and workability is most important to contractors. MIM’s position has always been to select the lowest strength mortar type that will satisfy structural requirements – a longstanding recommendation that is similar in many other parts of the country. ASTM C270, Standard Specification for Mortar for Unit Masonry, has no requirement for, or limitation on, maximum compressive strength. ASTM C270 Appendix X1, Selection and Use of Mortar for Unit Masonry, states in non-mandatory language that mortar should be weaker than the masonry units. The Canadian Standards Association, CSA A3000 Cementitious Materials Compendium, includes an optional requirements provision for a maximum allowable compressive strength for masonry mortar in Annex A of A3002-13 on masonry cement and mortar cement, stated in non-mandatory language. MIM’s Generic Wall Design Masonry Specification states the contractor shall select one of the following cement options for mortar: masonry cement, mortar cement or portland cement-lime.